Sometimes children can be a handful. 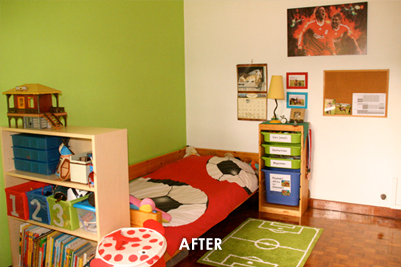 However, the arrangement of their bedroom is one way of positively influencing their behaviour and well being. 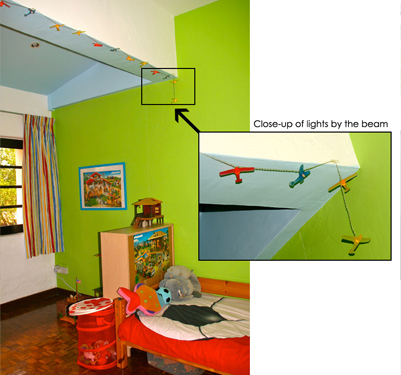 This young boy’s bedroom was in the East sector of the house. One wall was painted lime green, his favourite colour. Curtains and accessories in blue enhanced the wood element of the sector and therefore his growth. A few dots of red were supposed to weaken the quarrelsome No 3 Mountain Star in his room. The bed was facing North-West, his growth direction. This is usually the best direction for a child to sleep in. Despite all this my client asked me for help because she felt her son had become quite stubborn and hot-headed after the family had moved into this house. Although principles of good Feng Shui had already been applied, when dealing with an unruly child it is best to move the bed to his or her “Love” direction. Therefore, I recommended to move the boy’s bed to face South-West, which is his Love direction. 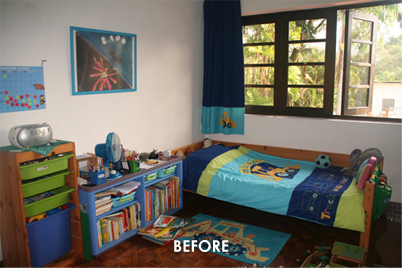 A new bookcase was placed at the bottom of the bed to give support and stop his feet pointing out towards the window. A string of small coloured lights was hung up to diffuse poison arrows from the ceiling beam which would otherwise be hitting his bed. The young boy always liked horses. As it happens, according to Chinese astrology, the boy is a Sheep and the Horse is his “secret friend”. A horse calendar was already hanging in the South corner of his room and two new horse pictures were added to the display. These will bring new friends into his life who will help him without his even being aware. As a result of this, the room feels more spacious and more harmonious. His mother tells me that he is now back to being the kind, considerate and delightful boy he used to be.The curtains were also changed (this was actually a wish by the boy himself), the new ones being a multi-coloured stripe which overall added more red to the room and helped to further subdue the ill-effects of the quarrelsome Star No 3.